Hello everyone! 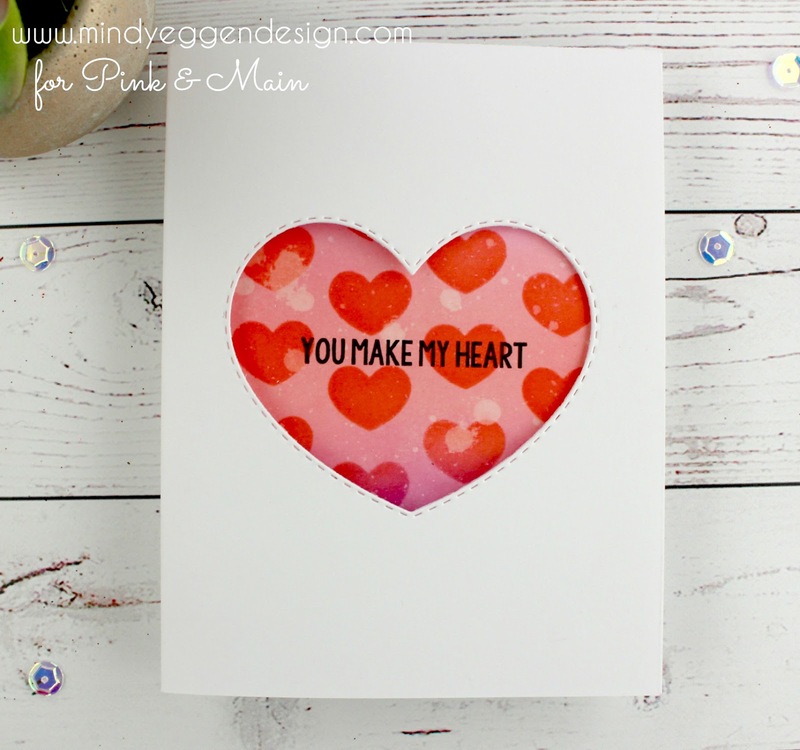 My card today is featuring some products from Pink & Main. There is even a video to accompany the card down below. I started by creating my stenciled background. I’m using a piece of Bristol Smooth cardstock and adding Picked Raspberry, Abandoned Coral and Seedless Preserve distress oxide ink. 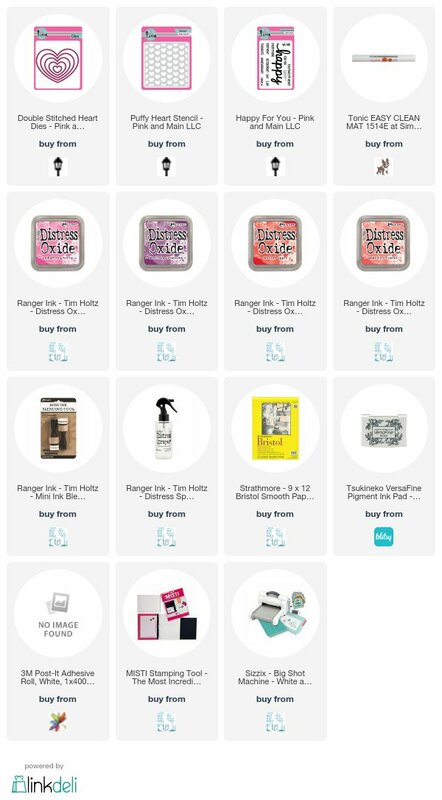 I just put on a light layer of these colors. 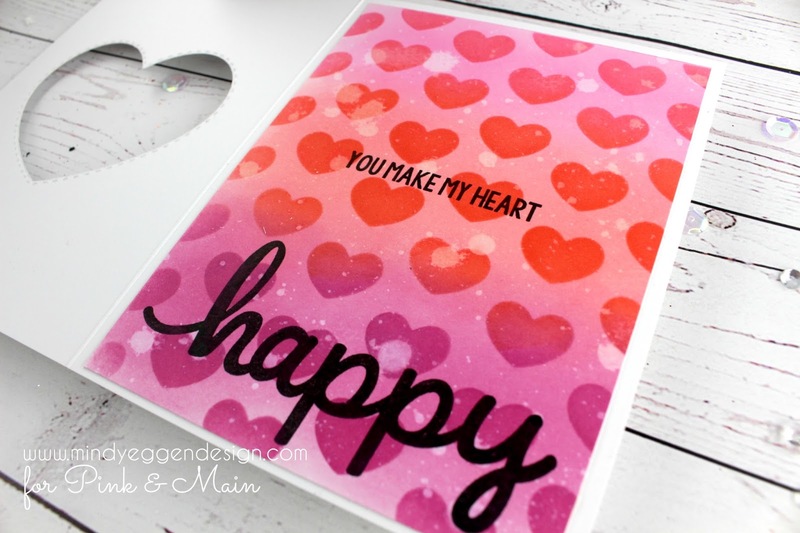 Next, I attach my Heart Stencil onto of my inked background. I’m using some painters tape to hold the stencil in place on my mat. Then I go back over top the stencil with the same colors as before, in the same order. I add a little bit of Candied Apple over the top of the Abandoned Coral part just to make sure it pops a little. I remove my stencil and now I have this beautiful tone-on-tone background. Using my distress spray bottle, I add a little bit of water spots and dab up with a paper towel. I will then trim this piece down to 4″ x 5 1/4″. Next, I use a full cardbase, open it up and line up my Heart Die in the middle of the front of my card. I hold the die down with some post it tape while I run it through my Big Shot. The post it note tape is great because it won’t tear my paper when I remove it. 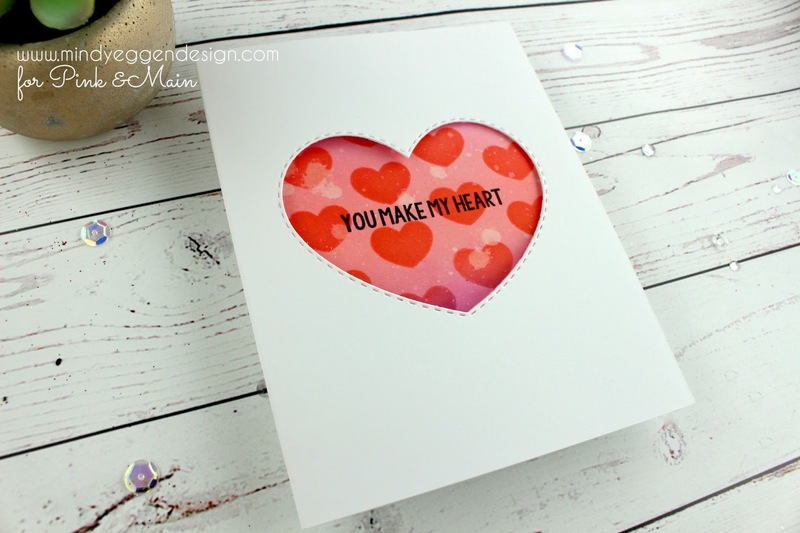 These Heart Dies are fabulous because it leaves a stitched edge on the heart piece cut out and also the outside where my window is, so I can save my cut out for another project. Now I have this sweet window to show through my card. I can go ahead and attach my stenciled background to the inside of the card. 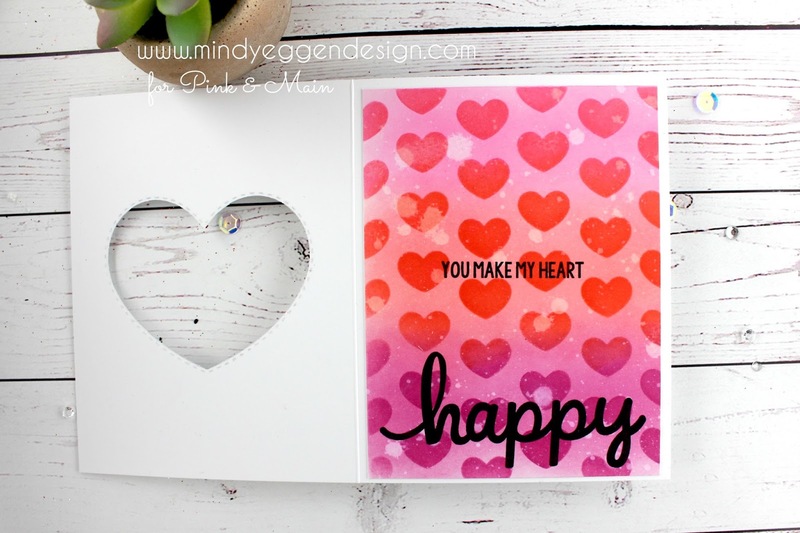 Using a misti tool, I line up my sentiment with the card front shut so I can get it perfectly set in the window. Then I open the card front and stamp using some Versafine black ink. 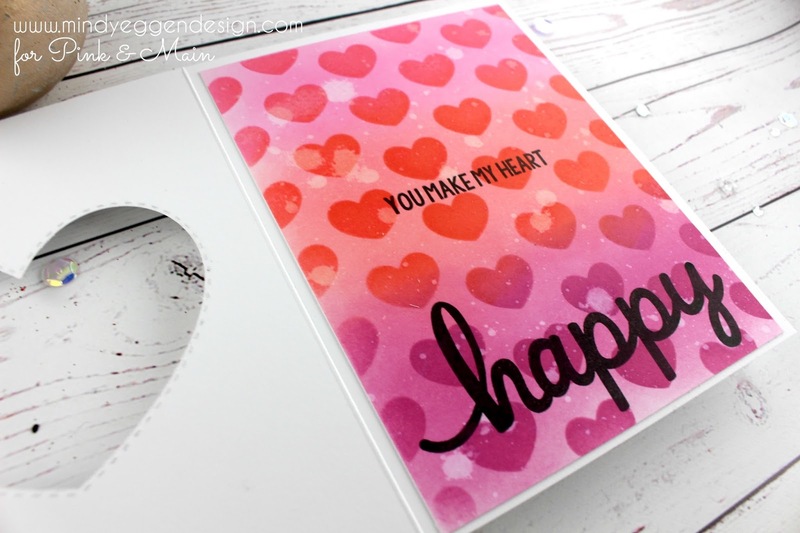 I also go ahead and stamp the word Happy at the bottom of the card and give these a few minutes to dry. Now I hav this fun sentiment hidden inside the card! This was a simple card to put together with a big message! I hope you enjoyed it and will give it a try. You can view the video down below or on my youtube channel HERE.